The plot of this incarnation of Godzilla focuses on seismic activity in Japan 15 years ago that lead to an incident at a nuclear power plant and a subsequent quarantine. Bryan Cranston (Walter White himself) once again shines on the big screen as one half of a husband/wife team of American scientists stationed in Japan. The incident is devastating to Joe Brody (Cranston) and we flash forward to the present where he and his son Ford (played un-inspiringly by the wooden Aaron Johnson) attempt to uncover the real cause of the destruction. It's no real spoiler to know that Godzilla and his monster pals have played a part in said incident. Ford, along with two scientists played by Ken Watanabe and Academy Award nominee Sally Hawkins (way out of her element here) join a team led by (the always excellent) David Strathairn to minimize the global destruction caused by Godzilla and two Mutos (sorta like Mothra). As in most monster movies (Pacific Rim for example), the real focus is not on the humans but the giant battling monsters themselves. And Godzilla and his two rival Muto monsters do NOT disappoint. All three are so gigantic in size and scope as they lay waste to large cities. Weta Digital (the geniuses behind the Lord of the Rings / Hobbit effects) once again do an amazing job in building digital creatures that blend in perfectly with the real life scenery. Director Gareth Edwards (whose small-budget first film - Monsters - I saw on Netflix recently) is right at home with his big budget directorial debut. He has a pure talent for shooting large-scale action and there are quite a few unique perspective shots throughout. In particular, it's amazing to see how immense Godzilla looks swimming through the Pacific Ocean. Edwards does a great job of pulling back with the camera at times to show these behemoths battling. We don't get a bunch of quick cutting and blurred close ups as you find in other fast-paced action films. Michael Bay could learn a thing or two from Edwards about directing giant battle sequences. I feel that Edwards is right up there with District 9's Neill Blomkamp as one of the best young action directors working today. The final sequence of the battle between a Muto and Godzilla at the end of the film is truly jaw-dropping to watch and almost worth the price of admission alone. This movie really is on par with Pacific Rim and is actually a little more grounded in reality (if you can believe that). If you enjoy top-notch visual effects, theater-rattling booming sound and some really entertaining action sequences, then you don't want to miss this version of Godzilla on the big screen. I did not see this in 3D and I heard it's not really worth the extra money. I was going to give this movie a 4 JR rating right after I saw it but I just have to kick it up one notch after thinking about the amazing visual effects. It's not near perfect thanks to some really bland acting across the board and an unnecessary bloated cast (the beautiful Elizabeth Olsen is basically wasted here as the wife of Ford whom we really care nothing about). However, this film is not about the actors and the sheer big-budget experience and expert craftsmanship put forth by Edwards leads to a solid 4.5 out of 5 JR rating for Godzilla. Expect to see at least one or two sequels put forth by Legendary Pictures after the box office success of this one. A few weeks ago I went to the Angelika Cinema by my work with my lovely new wife to see a film she wanted to see. Belle is the true story of an illegitimate mixed race girl born into a wealthy aristocratic family in the late 1700's. 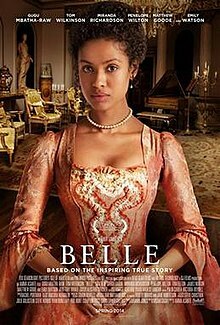 Gugu Mbatha-Raw plays Belle and does a very capable job alongside such talented actors as Tom Wilkinson, Emily Watson and Miranda Richardson. The story is interesting but slow paced. My wife loved the film but it really just isn't my type of movie. I would have to give it an average 2.5 out of 5 JR rating. If you are into period pieces and love Downton Abbey then this film is for you.